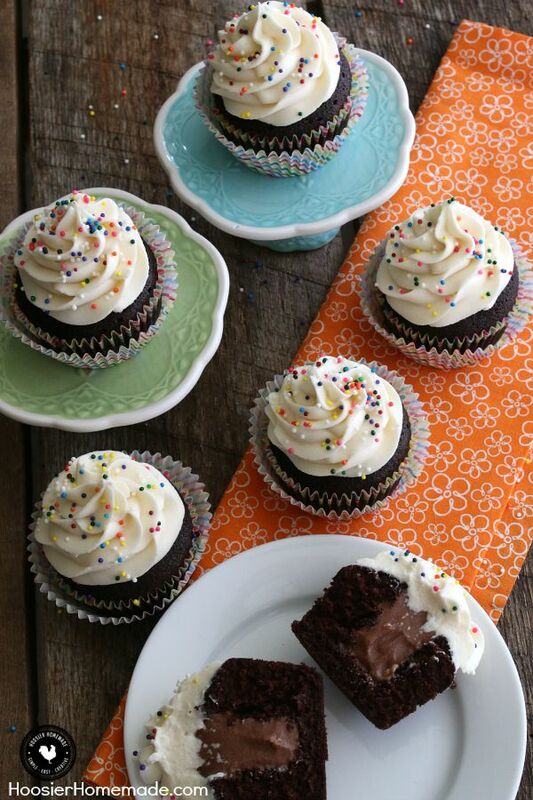 Adding filling to cupcakes is easy and gives them an extra special touch. This Chocolate Mousse Filling Recipe needs only 3 ingredients. 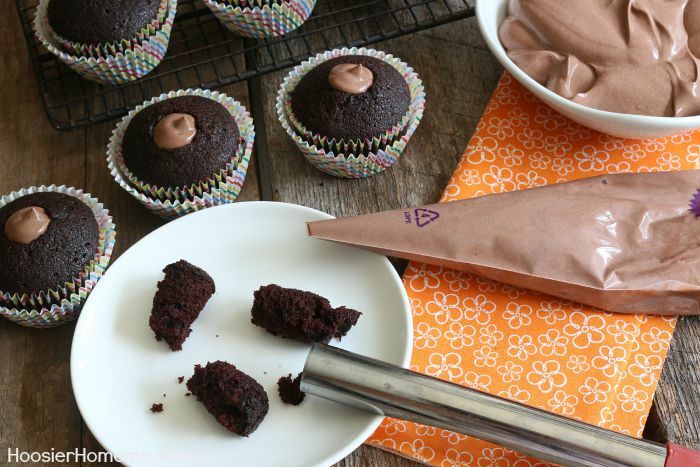 The options are endless for Cupcake Filling Recipes. 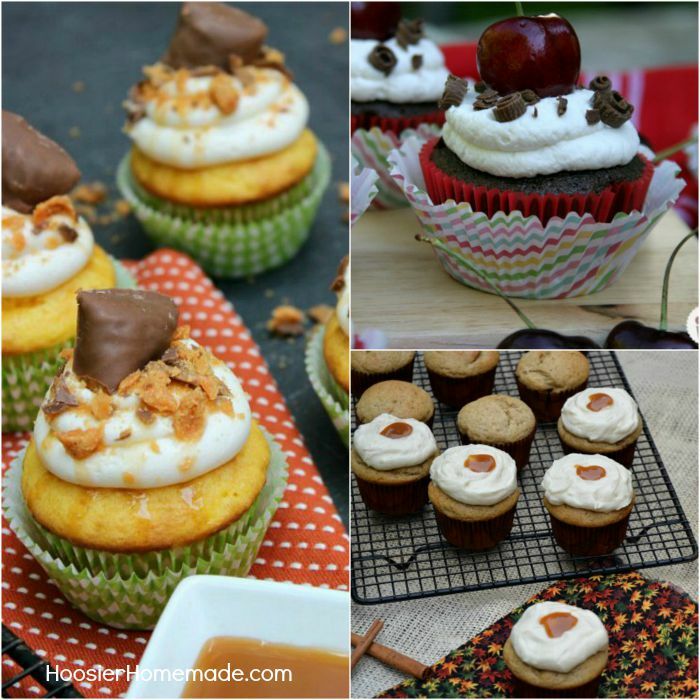 I have used caramel ice cream topping to fill Butterfinger Cupcakes, Homemade Apple Pie Filling to fill Cinnamon Cupcakes and pie filling straight from the can for Black Forest Cupcakes. It’s really hard to decide which one I like best, but this chocolate mousse filling recipe is probably an all-time favorite. And with only 3 ingredients, this is definitely easy to make. 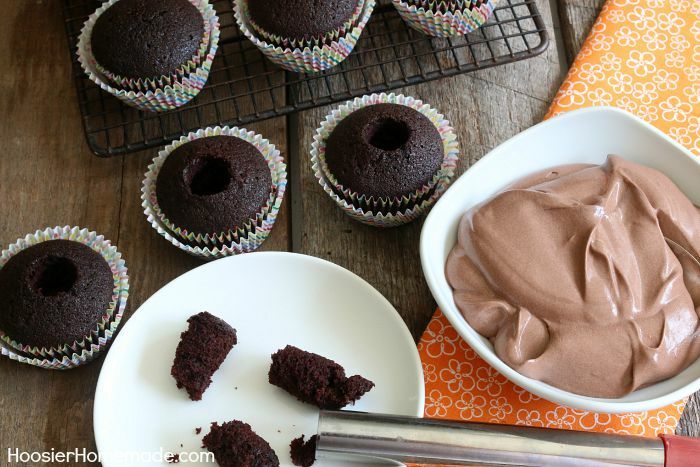 And not only is this Chocolate Mousse Filling Recipe perfect for filling cupcakes, you can use it in any dessert or enjoy it entirely on its own. But first, let’s chat about the cupcakes. You can, of course, use any flavor you like, the cupcakes I baked are from a box mix, and are actually gluten-free. I have found over the last 5 months or so, that I feel much better if I don’t eat gluten. So I am beginning to experiment a bit with gluten-free baking. I decided on chocolate to go with the chocolate mousse, but yellow or white cupcakes would be just as delicious too. 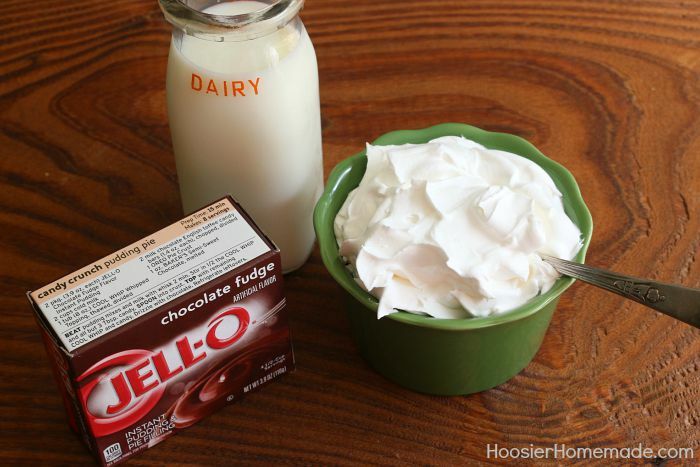 To make the Chocolate Mousse, you will need a small box of instant pudding (you can use cooked if you prefer), milk for the pudding and whipped topping. If you can’t purchase whipped topping where you live or don’t like it, you can also use whipping cream. 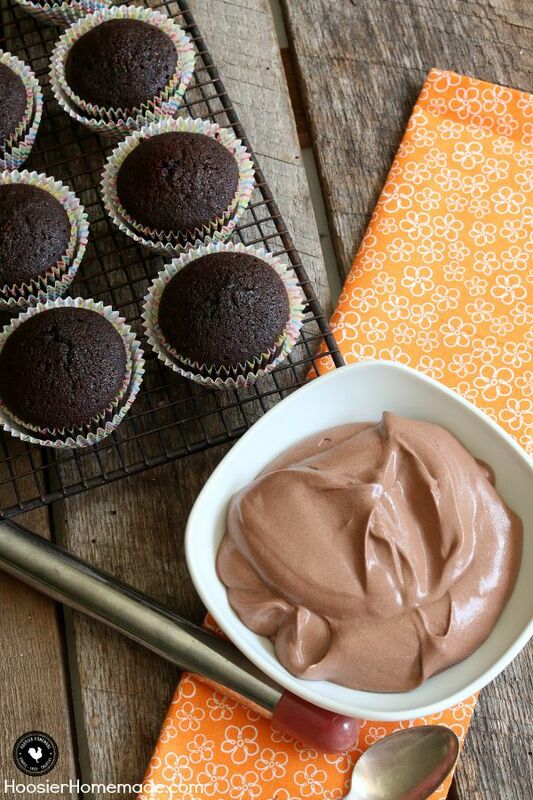 After your cupcakes are cooled and the mousse is set, you will need to prepare the cupcakes for filling. There are several different methods for filling. You can watch my video to see how to add filling to a cupcake. This time, because the mousse is a little softer than some fillings, I wanted there to be a larger hole, so I used an apple corer. 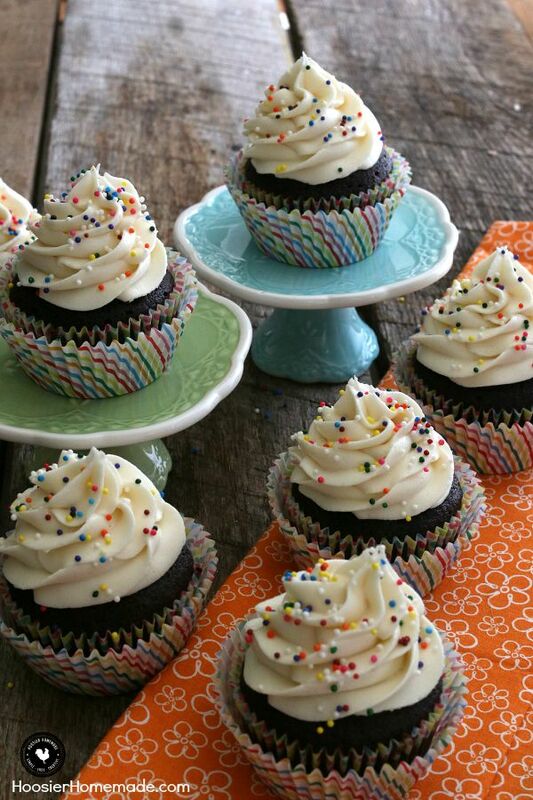 Be sure when you are making the hole that you don’t go clear to the bottom of the cupcake, or the filling will leak out into the cupcake liner. Then it’s time to fill the cupcakes. You can use a spoon if you like, I like using a decorator bag, it’s quick and easy, and less messy. Now you can frost them. I used Buttercream Frosting, and a decorator bag fitted with a 1M tip. And of course, sprinkles are always fun too. This recipe makes enough to fill 24 cupcakes plus some left over. I used the filling recipe, but it seemed like pudding to me. I also used a box cake mix like recommended, but wasn’t quickly reminded that I strongly prefer cakes from scratch because the flavor is better. This recipe is good, but when searching for something special you’d want to use again- this isn’t it for me. Hi Betty, the filling is a lot like pudding, but fluffy like mousse. We like to keep our recipe simple and easy. You can certainly use a cake from scratch if that’s what you prefer. I was wondering if I was to make the cupcakes and put the cream in them the night before I needed them, would the cream seep into the cupcake and make it soggy? Yes Delaney, I would suggest adding the filling the same day. You can certainly bake the cupcakes ahead, and make the mousse ahead, then just quickly combine. Hi! Thanks so much for sharing this recipe! I’m going to be making cupcakes for my nieces 2nd birthday and I’m wondering if by any chance you had tried freezing any of your cupcakes with the mousse filling in them? I’m hoping to make them in advance so there’s less work to do right before her party, but I really want to use your filling recipe! Hi Kaylene, I did not freeze them. However, you can easily freeze the cupcakes, then make the mousse separate and have it ready to fill on the day you serve the cupcakes.